Gunilla Löfgren is an innovative, mixed media abstract artist influenced by Vedic Art principles. She imbues her engaging and tactile compositions with a range of esoteric, contemplative and symbolic qualities. 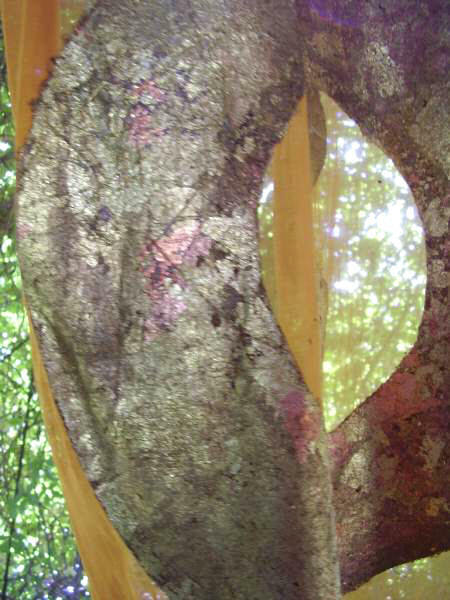 applies reversed alchemical processes and incorporates such diverse materials as Salix, textiles, sculpture, thread, metal leaf, sand and earth. The artist lives in Sweden where she has had many exhibitions and artworkshops in addition to those in Italy, Kurdistan/Iraq, Bulgaria, Denmark and India. 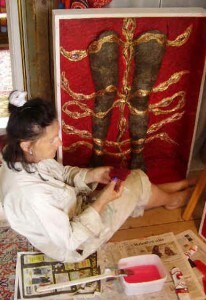 Her art is represented in numerous public and private collections worldwide. 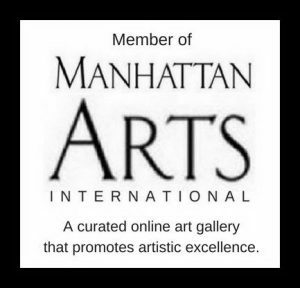 Arts International. She got a Premio De Marchi, and won a second Place Award from Trevisan International Art, among many others. 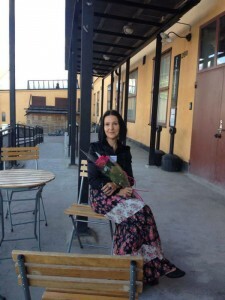 She received a grant from Foundation for Culture, Gunvor Göranssons Kulturstiftelse, Sandviken, Sweden. The artist is a member of The Swedish Artist National Organisation (KRO); Swedish Artists (Svk) and International Association of Art (IAA). My creativity centres mostly around seeing/feeling/exploring. the tension, the power and the passion in and between firmness and dissolution, structure and creative chaos, between immobility and movement, lightness and weight. To feel the challenge in the visualization, the watching and a wish to see behind, beyond the artistic expression. I think it is about challenging your visualization, re-evaluing, overthrowing, setting the room into rotation and seeing if something new appears and allowing the artistic expression to work outside its known context. During various periods over the years, I have worked in many different materials. From words and politics, free form embroidery and gardening followed by words and politics and vegetable dyeing with natural colours to ribbon and rosengang weaving, carding, matting, working in leather, sweaters with pictures and symbols, words, dirt, children, making dolls for Waldorf schools, tending sheep and creating art, and now Salix, textiles, sculpture, scrap metal, pelargonium flowers, wood, wrought iron, gardening, words and dirt and art creations mostly in glowing red and reversed alchemical processes and a wish to be part of the energy-filled movement/ rhythm. The storied pictures you see in the gallery can be likened to collected movements that hide experiences and thoughts, maybe secrets. The other pictures are fragments of the same stories but in the form of jettisoned movements. From structure/order/ cosmos out into creative chaos. Parts of the structure is jettisoned. Thinking in rhythm, creating movements, a shape that is rejected. Room in uproar. Dare to see, dare to break patterns. What does the viewer see? Who is the viewer? Who sees whom? Maybe it becomes a dialogue between you and you? A movement without end. The first time I encountered Vedic Art was when I saw a notice on the bulletin board in a supermarket. It caught my interest immediately, because I had felt for some time that I was not progressing in my creativity. A lot of energy is created when several artists paint in a room, and I became part of this shared, joyful creative power and could get rid of the demanding feeling that sometimes is part of the creative process. I started with the beginning course, followed by the intermediate course and finally the teacher training course to be able to acquire a deeper knowledge and insight into Vedic Art. I also wanted to share my knowledge by giving classes. Vedic Art is a method, a way. An easygoing and joyful way to approach, taste and maybe also grab a hold of painting. For the one who has already actively painted, Vedic Art provides a possibility to explore deeply, let go of performance and instead relax into the creativity. Let the creativity take care of itself. For the one who has never held a pen or a brush earlier, there is the happy discovery that creativity comes from inside of you. Vedic Art is not about painting or about painting in a special way. What is created on the canvas or on the paper is not connected to any criticism. What Vedic Art attempts is for us to find the personal- your very own expression! The courses build on each other and are process driven.